Starvation in many parts of Africa is often the result of exhaustion of the soil. In Western Europe this problem arose in the 19th century caused by a fast growing population. The use of chemical fertiliser solved the problem. But chemical fertilisers are much too expensive for most African farmers. A possible solution is the use of biological ‘fertiliser factories’: leguminous plants (pulses). Most plants need nitrogen to grow. Their roots take this from the soil in the form of nitrate (NO3-) or ammonium (NH4+) . But when the reserves of nitrogen – and the soil – are exhausted the growth of plant will be hindered. Leguminous plants like beans, peas, species of Lathyrus, Acacia etc, can produce the nitrate or ammonium they need from the nitrogen gas (N2) from the atmosphere. The produced nitrates and ammonium can turn up in the soil by two ways: in manure, when the plants have been eaten by animals or directly from the plants after their death by the activities of bacteria. In this way leguminous plants work as biological nitrate factories. No chemical fertiliser is needed. When these plants are grown in an exhausted field for one or two years it is possible to grow other crops for three years. Natural regeneration of the soil would take 30 to 40 years. 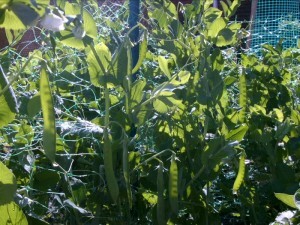 Leguminous plants have more advantages; the beans or peas can be eaten or sold, (they contain a lot of good proteins), the leaves can be fed to cattle. Once the soil is enriched other crops will grow better. In local economies where farmers start growing leguminous crops under nourishment and infant mortality decline fast. The system helps in the struggle to fight poverty. According to Ken Giller of Wageningen University (Netherlands) the Western countries must play an important role in this process. When the exported pulses can be sold in Europe for a good price the money can help improving the involved farms in Africa. In practice there often is no such thing as ‘fair trade’ because of the subsidies for the agriculture in Europe and the USA. A second problem is that the market in countries like Kenya is often flooded by products donated by Western countries (like milk from Holland). This sudden abundance means that the local farmers can not sell their products and lose their income. Nitrogen is an important element in all living things. In which chemical compounds is Nitrogen always present? Describe the cycle of Nitrogen in nature. (If you have to look this up, you will find it in your biology book, chapter ecology). The production of nitrates in the plants is done by bacteria in the roots. What is the name of such co-operation between organisms of different types? Which other elements are usually present in chemical fertilizers? Why is it in the long run not good for the soil quality when only chemical fertiliser is being used? An important portion of the fodder in European countries (like the Netherlands) is being grown in other parts of the world (Brazil, Thailand and USA). In those countries they use fertiliser that is partly produced in the Netherlands. In this country (Nl) more meat is produced than the population eats. This means that a big part is being exported, which brings in money.In organic agriculture the cycle is closed within the farm, or anyway within the region. Compare the sustainability of the organic and the ‘normal’ system. Note the environmental problems arising in the ‘normal’ agriculture, both in the countries where the big animal husbandry industry is, and the countries where the fodder is being produced. The production of chemical fertiliser takes much energy, the transport too. If people would eat much more food that is made from leguminous plants (instead of meat) the human footprint would be much smaller. Peanuts and soybeans also belong to this group. Which nutrients are to be found in these products? Why would people need much less meat if more pulses were eaten? Organic farming works without chemical fertiliser (or very little). Opinions differ about the question if mankind could be fed without chemical fertiliser. Scientists say that two billion people are alive today thanks to fertilisers. How could the use of these chemical be diminished without making people go hungry? What is meant with ‘Fair Trade’? Which product can you buy in your country through Fair Trade? Discuss in small groups, by e-mail and otherwise the possibilities of sustainable agriculture. Find information about ‘Fair Trade’, about possibilities to use as much as possible food grown in your own surroundings. Or: concentrate on the problems of feeding the population of Africa and the connections between that and the over consumption in the rich countries. (Where up to 40% of the food is thrown away…) Best do this together with students in other parts of the world.